My goal here is to make your life easier, especially those who are in the unique situation of being a military spouse. Yes...I've been around...but in a good way...and hopefully can share those tips, tricks and shortcuts with you too. I've been on this military bus for over 40 years now. My goals in life are to have a well-run home, few money worries, well adjusted children, money socked away and whatever happiness I can scoop out of life. After life as an Army brat, being in the Army myself and marrying a soldier, I can honestly say I have a bucket full of life lessons I can share to help you make your everyday life easier and enlightening. Don't waste your time making unnecessary mistakes and benefit from others who have come before you on your journey through life. These people are going to need a very big shovel! Non-stick Pans and Canaries - Urban Legend? Why is it that these payday loan places are littered outside every front gate? I just have to vent a little today. I just had an internet payday loan company want to advertise on my blog. I politely declined, but I wanted to say "Are you out of your mind?!!!" I am wondering if people realize, when they go to a place like this, they are paying over 500% interest on a short term loan!!! You can get a better rate from your neighborhood loan shark for God's sakes. With that being said, there are some things you can do NOW to keep yourself from ever walking into such a place again. I promise. Are you living beyond your means? Do you have more going out than coming in? Did you have a big setback or a series of setbacks that caused you to slip and literally, fall down? How is your self-esteem? Do you feel good about yourself? Are you proud of yourself and your husband and what you have accomplished? Do you envy your neighbors? Do you find yourself buying things because they have them? Back in the day, were you the one to have the first thing on the block? Do you have someone you want to impress? Do you feel like you just can't get a break and why me? If you have one or more of these feelings....bingo...it's time for you to come out swinging. The best way to get out of it, is to take responsibility for yourself. I know that sounds harsh. I admit it...as Americans, and I do it too...we tend to want to blame someone else for everything that goes wrong in our lives. Many of us never learned how to go about with our finances. Why don't they teach us this stuff in high school? It's just not fair! Do you know what I found out? It is nowhere written that life itself, is supposed to be fair. It just isn't. Ask anyone of faith, and they'll tell you that straight up. So now what? Well, after you've taken personal responsibility for the things you have done...I say YOU have done, because even if there were outside forces, such as an illness or broken refrigerator or a series of events causing us to spend so much money....if we had been prepared...it would've only been a small blip on our radar screen of life. Start tracking what money goes out every month. If you are not computer savvy, then get a little notebook. Carry it with you. Just take the time to write down EVERYTHING you spend. The hardest thing to keep track of is the cash. All those trips to the money machine. I do it too sometimes when I get lazy...I don't like to keep track where I hand it out! Put each expense into a category such as food, housing and transportation. Compare that amount with what is coming in. Technically, we should be saving 10% (and some even say 15%) of our take home pay for retirement. We want to put that money in a tax-free environment...the best bet would be your 401k at work (some companies match what you put in up to 6%) or a Roth IRA or a Thrift Savings Plan (if you are a government employee). If you have kids, you should be setting some aside for college AFTER you get your retirement needs set aside every month. The rest, should all be divvied out into housing, food, utilities, clothing, entertainment, etc. After you add everything up, you should be able to see if you have more going out than what is coming in. Along those lines, you're going to need a budget. Budget is such an ugly word, but before you stop reading, know that a budget is a guideline for you and is not set in stone. It just gives you an idea of about how much you should be spending in each area of your life. You will even have a category for "blow money for me". Find out how to set one up. If you don't like the word budget, you can always take your retirement money and your kids' college money off the top...and then blow the rest of your paycheck. I've tried that too...but I tend to save more with a budget...I LOVE games and it turns into a game of how much more I can shave off every month. Start setting some money aside for an emergency or rainy day fund. Your eventual goal is 6-12 months of income, but $1000 to start off is great! Put $20 or $50 or whatever you can afford after your basic necessities to this goal each month. Never again be pushed into a corner when your car breaks down or you need to get your furnace fixed. Have the money ahead of time, and sometimes you can even negotiate a lower cash price. This will also allow you to raise the deductibles on your car insurance, saving you a few more hundred dollars per year. Keep this money in an easy to access account. We have ours in a bank money market account, earning about 5%. You can even write checks from such an account...perfect for emergencies. Start tackling your debt. Part of your budget will be tackling your debt. Once you pay your basic food, roof over your head, transportation and basic clothing, the rest should go to paying off debt. This is even BEFORE you invest a dime. It makes no sense to invest at 12% if your credit card debt is costing you 17%. Pay it off first, then invest. Dave Ramsey says you can subsist on variations of "beans and rice" and "rice and beans" while you are doing this. Get it done so it is not hanging over your head the rest of your life. Use the snowball effect to decide how much and when to send money to creditors. You may want to tackle a bit of your smaller debt first, not the high interest credit like many experts recommend, just to get yourself motivated to go on. That's the hardest part. I highly recommend Dave Ramsey's money makeover plan. Learn about compound interest. Every one of us, regardless of our income can EASILY become a millionaire by retirement, you included. We only have to set aside a small amount of money every month to do this and invest it.. Your muffin and coffee money alone could grow to over a million! The best way to do this is to sock it away tax-free and let it grow. Those choices include your 401k at work, Roth IRAs (max it every year) or your Thrift Savings Plan. If you don't have the money for something you really want, stop and think first. Do you need it or want it? If it's just a want, set aside the money every month and once you have it, most times, the item is cheaper AND you can whip out your cash and negotiate a lower price to begin with. Cash allows you to be in charge! There is never one of just anything (unless you are into antiques and such, but even then, if you are patient, it'll come around again). What do you do in your life to maintain control of your finances? How do you control spending and saving? I'd love to hear your ideas. There is a nifty little machine inside the grocery store near my house. It will roll all your loose change for you. All you have to do is dump the jar of coins into the slot and it counts it and spits out bills (and any leftover change). And in very small print it says it only charges you 9 cents on every dollar. THAT IS 9% PEOPLE. THAT IS $9 ON EVERY HUNDRED!!! I can roll pennies cheaper than that. As a matter of fact all the coins the kids roll themselves they get to keep! And it's the little fees and charges like this that pick away at what we earn! If you track what you give out for a month, you can quickly see where you can eliminate money wasting such as on things like this nifty machine (it is cool to watch though, isn't it?)! I'm with Jacki on the Coinstar machine...I'm not giving ANYONE $9 out of $100 (and I DO have $100 in coins, if anyone wants to come roll them for me!). My husband, ever the budgeter, used to have what he called "Prisoner of War Night" twice a month...just before payday. That was when he ate bread, rice and water, because that was all that was left till he got paid. But he never ever "floated" checks or used a credit card to buy groceries. I am truly blessed to have found this man - he got me OUT OF SERIOUS DEBT. And I listened when he talked. Because I, with an accounting background, was too busy looking at the bark of the tree to notice the forest. His best hint: Gather all your credit cards. Figure out how much you are paying each month...then start paying down. When I met him, I was the "proud" owner of over 25 credit cards...most of them were "store" cards and had HUGE interest rates (at least 21% or more). While I had low limits ($200-$500) on most, they were all maxed out. And I had FOUR major cards...ALL MAXED OUT. These carried higher balances of $1000-$5000. So you can just imagine how much debt I had. I started by taking the card with the lowest balance due. I paid the minimums on all the other cards, and paid as much toward the first card. It took me 2 months but that one was paid off...and I cut it up, closed the account RIGHT AWAY, not AFTER I paid it off. When I decided that was the card I was paying off, I cut it up. Now I had a few more dollars to put toward another card. Took the next lowest balance. Paid that off in one payment. And so on and so forth. It took me well over 2 years to get the debt down and the cards paid off. But I did it. And now, we, together, have 4 credit cards. Two cards (major) are joint account cards, so technically that's only one card. The other major card is one I've had for years, but use very little. It's tied to paypal/ebay, so I only use it then (and that's not often). And we have a Sears card...why I keep it, I don't know! But we pay our debt off monthly. And we watch our pennies. And we have NEVER (even I, as much debt as I was in) EVER taken a payday loan. Like you, I absolutely HATE seeing those places right outside the gate (along with strip clubs and used car "E-1 and up approved" dealers). Thanks Linda for sharing! It sounds like you maxed out on the debt snowball...that's something worth maxing..unlike those credit cards. I had to laugh at the POW night...I bet if we all replaced one night of eating out with such a meal, not only would we be able to sock away what...about $50 a month...but we would also be able to use that as a teaching moment for our kids as a reminder of those who are less fortunate. Thanks for the tip! 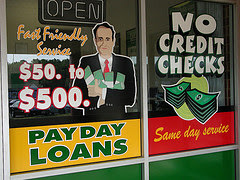 Payday Loans are not as bad as people think. For every $100 you borrow, you pay $15 in interest on the loan. But the problem lies when you don't pay the loan back in the short term. If you don't, then you end up paying interest rates around 400% or so when the interest is applied over a year's time. But, if used wisely, and how they're designed to be used, they are a great benefit to our society. I'd rather pour $100 dollars of coins into the coinstar machine and get $91, then have to pay someone $15 for every $100...that's just crazy. And the people who use payday loans aren't usually the ones who can even AFFORD the extra $15....that's why it's EVIL. Payday loans a bad news and yes! they specifically target the military personnel. Congress knows this and is trying to do something to help it's soldiers. But don't hold your breathe. As far as coinstar is worth: you have to calculate how long it will take you to roll $100 worth of coins? If it is a least an hour, what is your hourly wage (or time worth)? Let's say you earn $15 an hr. You have to earn at least $22 to net that $15 to spend. So you have to work one hour and 45 minutes on the job to net the one hour it will take you to roll the coins yourself and save the $15 of lost wages, and time rather than pay the $9 fee for a few minutes of the time it takes you to dump the coins into coinstar. Penny wise. Dollar foolish. Literally. You have to ask yourself what your time is worth. If it is advantageous to roll the coins yourself, bring them to your bank, write your acct number on the paper roll first (because some banks won't take the coins if you don't have an account with them) then by all means, get rolling. As for me, I never have more than $20 in coin, so I pay the $1.80 to coinstar. I find more than that on the street. Regarding Coinstar vs. the time it takes to roll coins, you might check with your bank. Paying 9% for coin counting at the grocery store seems excessive to me, so over the last several years I've been rolling my own. The last time I took a bag of carefully-rolled coins into my bank (Wells Fargo), the teller asked for assistance from another teller, and the two of them spent a few minutes *opening* all of my rolls and emptying their contents into the tray of a big automated coin counter. When she came back, she said, "In the future, you don't need to bother rolling coins - we just have to dump them all in there anyway." So it would have been easier on them if I _hadn't_ rolled the coins, the counter's total exactly matched what I'd added up from the rolls, and there was no service fee. Um, if it wasn't for cash advances, my parents would've lost their house 10 times over the years by now. Payday loans are good for emergencies like what my parents have had to deal with sometimes, but not on a regular basis. What you learn is that when you've been self-employed most of your life and you can't find a job working for anyone else, you have to take money where you can get it, even if it IS at an insane interest rate. When I was living with my parents, I thanked GOD for payday loans, lady. Without them, my family would NOT have been able to stay in their house long enough to get out of debt and find a new source of income. Paying the crazy interest on the payday loan is preferable to losing tens of thousands of dollars of interest paid in to the mortgage company over the past decade or more any day of the week. Everybody keeps talking about how evil payday loans are; well, they're not. Have you ever even had to GET a payday loan before? If not, maybe you'll be in the situation one day where you can't get money from anywhere or anyone else and you'll appreciate their existence then. People should be aware of the interest rate when they get a payday loan, but people like you who have probably not ever had to set foot in one of these stores trying to advise people who DO have to use them really piss me off. Managing and saving money when you're a $10/hr employee and you have 2 or 3 kids to feed and a $1000/m house payment (when it should be $700, but they keep raising your interest rate) isn't as easy as you make it out to be. Talking about how to save money seems to amount to a "game" to you. It's not a game to most people who actually have to go through it, so before you start talking about the "evils" of payday loans, maybe you should put on the shoes of someone who actually HAS NO CHOICE but to get a payday loan or lose their house. Or get their electricity cut off. Or pay their car payment so they can get to the job that has their paycheck on Friday. Or have grocery money until they get paid next week. Grow up. I think I see your frustration! And that's exactly what I mean about these darn payday loans...that you feel you have no other choice! No, I have never had to live hand to mouth, and I consider myself lucky...BUT, I have commanded young soldiers back in the day who got suckered in by these places instead of managing their nice sized paycheck...it's like playing with fire. That was my intended audience for the most part. It sounds like your parents had an income problem...their debt issues were only as a result of that...and as long as people in such a situation accept that this is all they're going to get and this is all life has for them, then they'll continue to have to go to places like this to survive. And I think that's just plain rotten...shame on our society and school system for not teaching kids basic financial management and not getting more opportunities for young kids to succeed so that all they have to look forward to is minimum wage. You're right, minimum wage is not enough to survive on and without outside assistance, many would go under. I agree that taking out payday loans regularly can be a bad habit to get into, but in times like these it is necassary for a lot of people. As long as these people are paying back their loans on time, the interest rates aren't above normal credit card rates. The 500% rate is for the year, and hopefully if you take out a loan you're planning on paying it back in the time allotted. If you pay it back on time the interest rate is 36%, which is still expensive, but much more reasonable. cash advances and payday loans come in handy when emergencies pop up, and one is a little short on cash. whether its for a kids birthday, the cable bill, or gas in the car; the fact is that everyone has hard spots. millions of people have taken advantage of this hassle free service. If you don't, then you end up paying interest rates around 400% or so when the interest is applied over a year's time. But, if used wisely, and how they're designed to be used, they are a great benefit to our society. Well, 2 years go but the situation with payday loans today still the same... Is it good or bad i don't know, but 500% rate is really very-very high, especially for short time payday loans up to $1500.